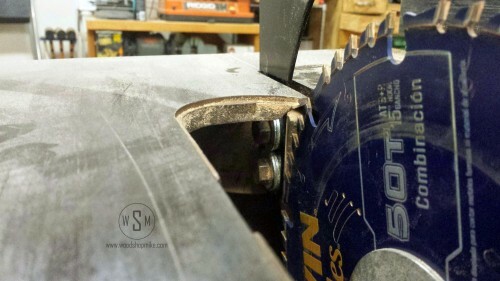 Worried about kickback on your table saw? Who isn’t really? 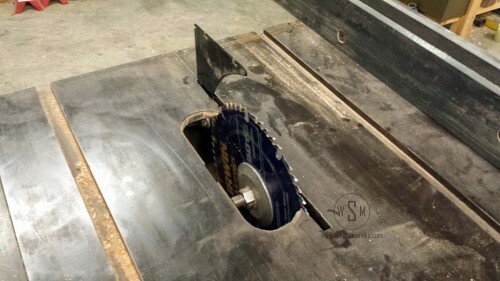 Most if not all modern saws arrive with either a splitter or riving knife that prevents wood from pinching the back side of a table saw blade as the stock is run through the saw. This little piece of material pays dividends in preventing kickback. So if most saws come with such a device already installed, why write a review about an after market product? Because if you’re like me, you use vintage machinery. In my case, a Tannewitz FDS that was made in the 20’s, before such folly was considered or, the original splitter on your slightly newer 40’s model Walker Turner 1180b was lost. Now that we’re all on the same page, let me clue you in on a superb product! Shark Guard is the creator of the high quality splitters I use on my Walker Turner 1180b. 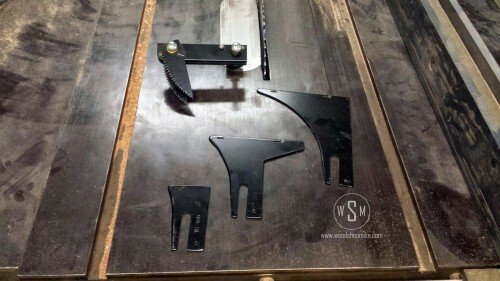 These items install easily and come in a variety of sizes so that you can use a splitter that most closely matches the stock that is being cut. 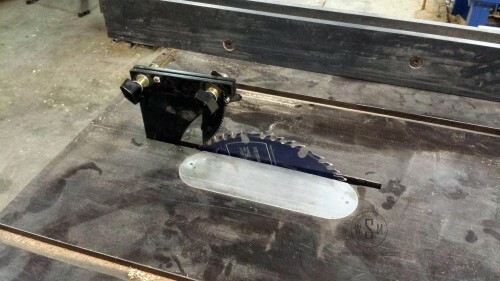 I purchased the set of 3 splitters that are .090″ thick because I generally use thin kerf blades. I also ordered the anti-kickback assembly, which can only be used with the two tallest splitters. Splitters are also available in .105″ and .120″ thicknesses. How much easier could it be? 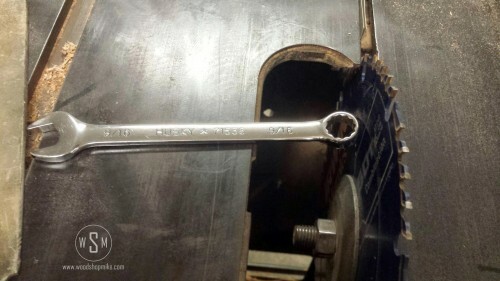 I simply loosen the two bolts that once held the original splitter and blade guard assembly with a 9/16 wrench. Now just drop the splitter over the two bolts and tighten everything down. If you find yourself wanting to use the anti-kickback pawls, those are even easier to install than the spiltter! There are two pins that locate into notches on the top of the splitter. Line up these pines with the corresponding spots on the splitter, drop the assembly in place and tighten it down with the two knobs. Time for a break guys, that was hard work! After a few test cuts I noticed that the stock was rubbing ever so slightly on the splitter, so I added a shim to push the splitter over just a touch, but I’m just persnickety like that. You may or may not need to add a shim, and in all honesty, I would have probably been fine without it. All new splitters are made from 304 stainless steel. Also, the anti-kickback assembly has been changed to include three pins that locate on the top of the splitter. The addition of the third pin is to prevent installing the anti-kickback assembly backward. I’ve used this product for 2 years now and have never had any trouble. I generally don’t use the anti-kickback assembly due to preference, but it is well made and does not interfere with the operation of the saw at all. This option was mainly purchased for teaching others how to use a table saw. The only thing that would make this product better is if it came with a six-pack of your favorite brew. Until then, it still gets two thumbs up and will remain in service. A huge thanks goes out to the crew at Shark Guard for delivering a top shelf product! Full Disclosure: I purchased this product and was not compensated for the review of this product. Any help on finding a splitter similar to the Shark Guard on my Delta 34-670? I am not sure the saw is tooled to accommodate a splitter like this. I’m not familiar with that model so I doubt I’ll be much help. Does that saw have any kind of blade guard? If so you can probably have shark guard make a splitter for you based on the bolt hole pattern for mounting the blade guard (assuming it has a blade guard). No blade guard so I guess I am out of luck, to put it politely. I will probably go and buy a cheapie with a splitter so I do not chop my hand off! good fortune to all! Hi Jdrmonte: The blade guard assembly is still available for your Delta 34-670 It’s 69.00 at eReplacement parts.com. I believe the part number is 1313242 I believe. It fits your saw and I think every other model Delta made, except mine of course, I have a 36-650 and it seems to be the only Contractor class saw that the blade guard doesn’t fit.